Domestic and Damned Blog: Is it Saturday Yet? You've heard me say before, that mom is a very picky movie person. Very picky. She wanted to see a movie this week. Okay, righty-ho righty-ho. So there's me, in blockbuster on the phone with mom, reading off the titles of some of the new releases. No she didn't want that one, no she hates that actor, no she can't stand that style of talking, no she hates that actor etc. What did she settle on... SALT. Yes, an action film. And she loved it. Actually moved away from her computer for the two hours and watched the movie. Seriously, nothing gets mom away from her Facebook for more then five minutes. Honestly, it's a really good thing mom does not have a cell phone cause if she did she'd never leave the Facebook at all. And the last time I brought over a movie that mom actually paid full attention to was... The Pink Panther 2. Yeah, she's a mixed bag. The movies you think she'll love she won't even pay attention to, things you think she'll hate she is glued to. 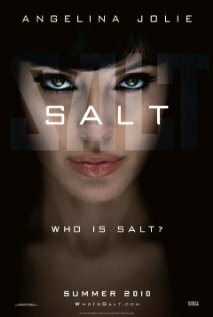 What did I think of the movie SALT... I just could not get past how much of a skeleton Jolie looked. That's too thin.